On March 16-20, 2016, public historians from across the United States convened in Baltimore, Maryland for the National Council on Public History annual meeting. I joined a group of scholars and practitioners for a roundtable discussion about the National Park Service’s involvement in urban parks since World War II. 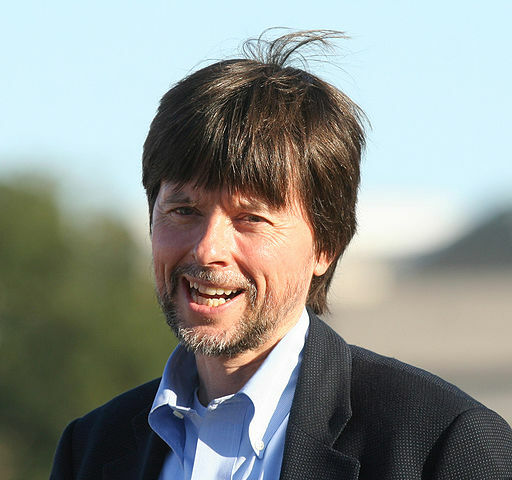 Mahoney points out that documentary film maker Ken Burns devoted 16% of his series “America’s Best Idea” to the history of the NPS after World War II. That’s not a lot of time! Source: Wikimedia Commons. Eleanor Mahoney, a doctoral candidate in history at University of Washington, could not attend in person, but offered the opening remarks. She pointed out that the historical narrative about the NPS has largely been dominated by the creation of scenic, western parks before World War II. Yet, the system has expanded dramatically since then and has become increasingly involved in urban parks. This roundtable was formed with the intention of disrupting this narrative. She also pointed out that the importance of the interaction of political economy with conservation policy. The Great Society programs of the 1960s and environmental movement of the early 1970s provided the impetus for park expansion, but the growing austerity of government spending under Ronald Reagan and his successors prompted the invention of flexible, though not always adequately funded, programs like partnership parks and National Heritage Areas. One of her last points was that these new parks, which are now the standard bearers for the NPS Centennial, are very different from the older, western parks that are continuously referred to as the “crown jewels” of the national park system. 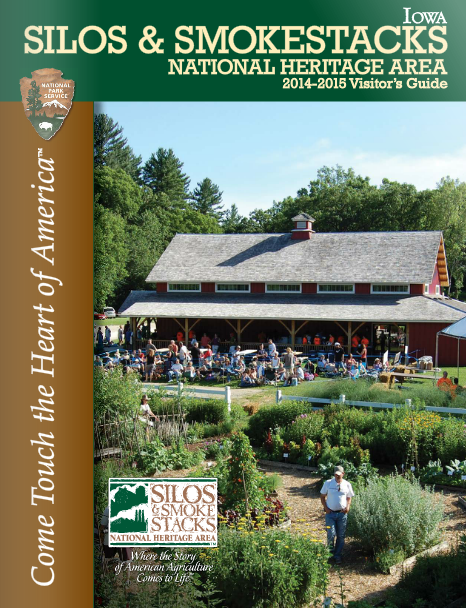 Cover of Silos & Smokestacks National Heritage Area, 2014-2015 Visitors Guide. Source: Silos & Smokestacks National Heritage Area. Patrick Nugent, a doctoral candidate in American Studies at George Washington University, provided deeper introspection about a specific NPS planning effort at Gateway National Recreation Area, located in the Port of New York and New Jersey. 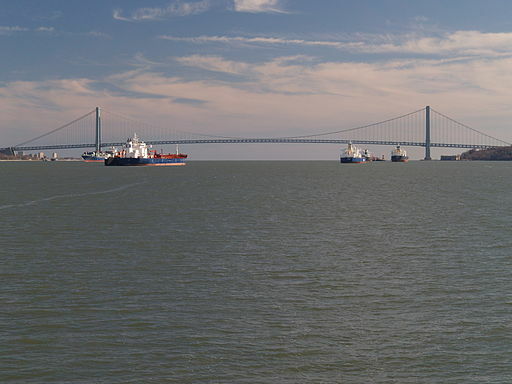 Patrick’s research on Gateway is part of his larger study on the environmental history of Staten Island in the decades surrounding the completion of the Verrazano-Narrows Bridge (1964). He shows that by the late-1960s, government officials and urban planners were in favor of creating high-density housing with access to mass-transit, and were considering a proposal from James Rouse for a “New Town-In-Town” to help alleviate unorganized, racially-segregated growth in the lower-third of Staten Island. However, the NPS forestalled these efforts when they added the Great Kills Unit on Staten Island to a proposed national park in the area. 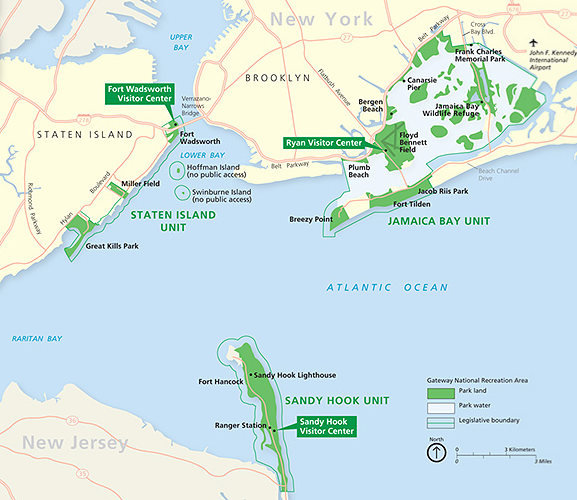 Congress established Gateway National Recreation Area in 1972, which thwarted opportunities for affordable housing and mass-transit opportunities in southern Staten Island. I presented a brief case study on the Job Corps program (here is a slightly longer post) to bring attention to the fact that urban concerns were often transplanted in rural, traditional national parks. The Job Corps was a War on Poverty initiative during the Lyndon Johnson’s administration. The National Park Service helped launch the Job Corps program by opening nine Job Corps Centers in eight national parks between 1965 and 1969. This program was modeled after the New Deal Civilian Conservation Corps, which put young men to work on conservation projects across the U.S. Program administrations targeted impoverished young men from inner city areas and the hills of Appalachia to live and work in these rural national parks. 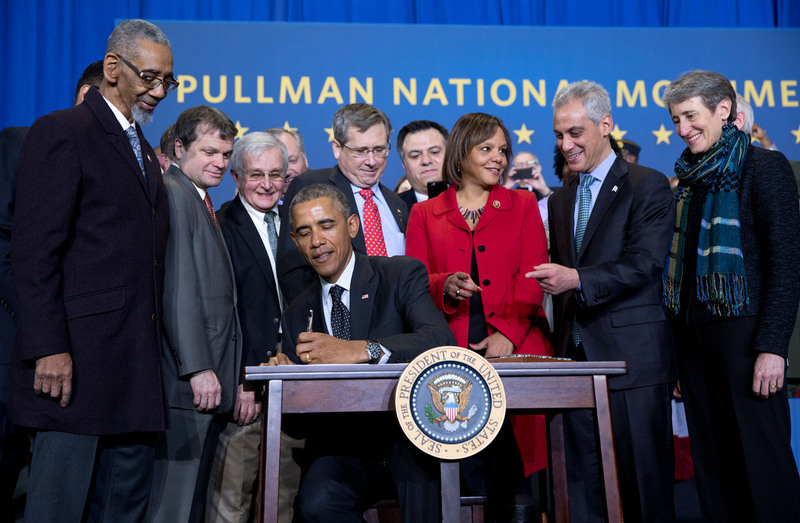 Unlike the CCC, the Job Corps was integrated, reflecting the influence of the Civil Rights Movement. This added an additional layer of complexity that I think makes this program worthy of study. As the Johnson administration fell out of favor, so too did his domestic programs like the Job Corps. President Nixon closed all but three of the NPS Job Corps Centers. The Forest Service administers these three centers today. The Job Corps program is important to look at because it was a notable point in the agency’s effort to diversify its workforce. Corpsmen completed a number of projects that are enjoyed by visitors and park staff on a daily basis, but are often unattributed to them. Finally, it underscores how the NPS has been involved in social and economic reform. 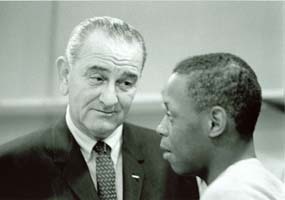 President Lyndon B. Johnson talks to a Job Corps enrollee at Catoctin Job Corps Center in 1965. Source: Catoctin Mountain Park. 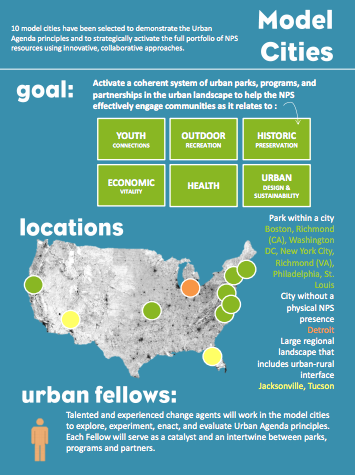 Missy Morrison is the DC Urban Fellow for the new NPS Urban Agenda’s Model Cities Program. The name itself borrows upon the Model Cities Act of 1965. Missy could not make the panel because of last minute emergency. Her perspective was certainly missed, but Rolf was able to step in to provide an overview. The agenda has three main goals: 1) Be relevant to all Americans 2) Activate “ONE NPS” 3) Nurture a Culture of Collaboration. Some of these ideas go back to the 1987 Urban Superintendent’s Conference. Brenda Barrett, our moderator, asked how we should look to the future. Patrick responded that we need to reconsider national parks as non-residential landscapes. The agency needs to consider lost jobs, homes, and transportation when these parks are created. Rolf emphasized the need for parks to have multiple uses to better meet the needs of visitors. The NPS is more sophisticated and should be able to accommodate a changing population. I responded that the lessons learned from urban parks could be helpful for those units that were once rural, but are now urban. Additionally, we can learn lessons from youth programs like the Job Corps to help improve our current youth initiatives. We then invited audience questions. These questions ranged from the impact of the National Heritage Area program on the national park system to current resistance to federal landownership. Another audience member pointed out Imperiled Promise’s directive to interpret how the NPS has shaped the landscape. We also discussed the new Coltsville National Historical Park (Connecticut’s first national park) and how/if the park will interpret gun violence at a place that was created with the support of pro-gun groups. Here are a few tweets for the session, but I’m afraid I didn’t catch them all. Special thanks to Eleanor and Patrick for their input on this post and Rolf and Missy for participating in our roundtable. Thanks to Brenda Barrett for being a calm, fabulous, and brilliant moderator. Angela Sirna received her PhD in Public History from Middle Tennessee State University in April 2015 and is currently working on an administrative history of Stones River National Battlefield. Her dissertation traced the development of Cumberland Gap National Historical Park from the New Deal through the Great Society. Angela also served as the Public Historian in Residence at Catoctin Mountain Park in 2013-2014 and completed a Special Resource Study on human conservation programs at the park throughout the twentieth century. This post was originally published on Angela’s blog, Landscape Redux.